I recently attended the Over The Air mobile development conference at the historic Bletchley Park, Home of the Codebreakers. This was a superb event including talks and hackday challenges covering a variety of categories. The challenge lasted just over 24 hours and in this time teams and individuals had to come up with something that was fun, useful, clever or just plain stupid! I had decided to enter the Internet of Things category and here is a description of what I came up with during that time. 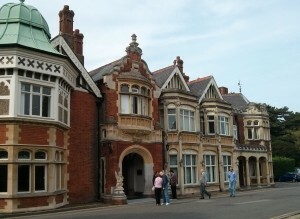 The photos included here were taken at the time of the event and subsequently used in my 90 second presentation for the audience favourite. By the evening of the first day I still didn’t have nay idea as to what I was going to do, other than using Node-Red as a way of interconnecting a number of devices. I had taken a large box of Arduino, mbed boards, cables, components, sensors, pcbs, tools and devices. I was looking to do something with wireless sensors that I had taken with me but what, I wasn’t sure. I eventually came up with the idea to use the TFT LCD display I had built previously. 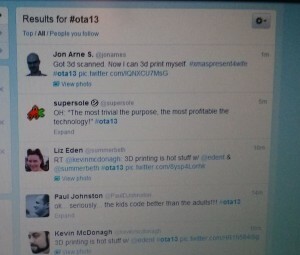 This would become a display for the temperature and also the number of tweets detected with the hashtag #ota13. As an added feature I added some very bright addressable RGB pixel strips as everybody likes flashing lights! 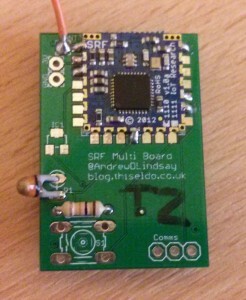 The temperature sensor node is a pcb and Ciseco SRF module running the LLAP thermistor firmware. For demo purposes it was set to send the temperature reading every 60s. 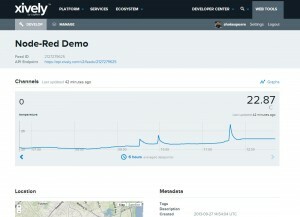 Full details of the sensor node are in a previous post. The display is based on a Ciseco RFu-328 which is basically a tiny Arduino with a SRF radio module in a surface mount form factor. The display is a cheap 128×160 SPI display. Its all put together on a PCB that I’d previously designed and had manufactured by Ragworm. A recent post describes the display. As an additional feature I decided to add a pair of Adafruit NeoPixel strips to provide an indication of the number of tweets seen. The connections for these had already been designed into the PCB, but up until this point, no sockets had been soldered on. The sketch used is available for download. To be able to receive temperature readings from the sensor and to send updates to the display I used a USB SRF Stick plugged into my laptop. 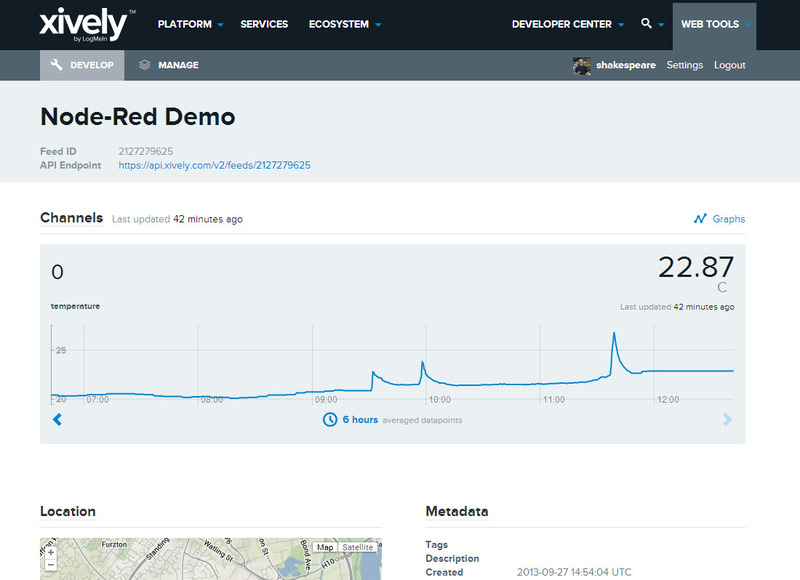 The obvious choice for integrating the various bits of hardware and other systems is the new Node-Red, Node.JS application. The screen capture of the nodes may look like there are a lot of nodes in there but this includes many debug and inject nodes used for debugging and testing the application. I’d pre-installed Node-Red onto my Windows7 laptop and installed all the required libraries, making sure it actually ran too. So during the hack day, it was only a matter of dragging the appropriate nodes into place, linking them up and writing the functions to do all the clever bits. The two main input nodes receive the LLAP input from the temperature sensor and search for new tweets with the hashtag #ota13. The input from the temperature sensor is formatted into a single message then directed to three (there is a fourth shown but this was not used in the hack) nodes that reformatted the data to a Xively datastream, sent it via the pushbullet.com api to my mobile phone and the third was to re-broadcast the temperature reading to the wireless display module. 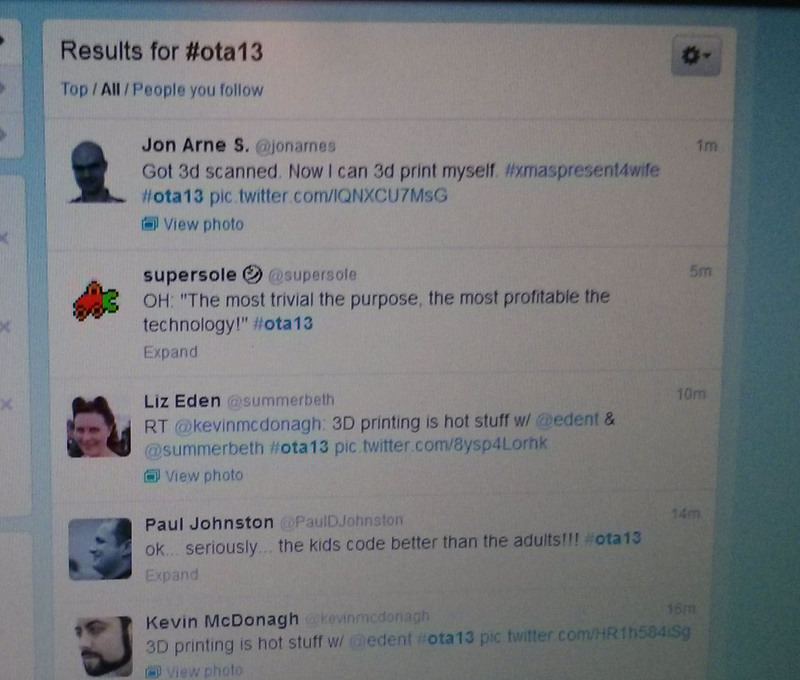 The second input node reads a twitter stream and filters on the hashtag #ota13. A count is incremented and the new value is sent to the wireless display. The code for the main nodes is shown at the end of this post. The twitter input node was configured with my usual twitter name and I’d put ota13 into both the tags and topic boxes. I’m not sure this made much different as it didn’t seem to catch every tweet with the hashtag. 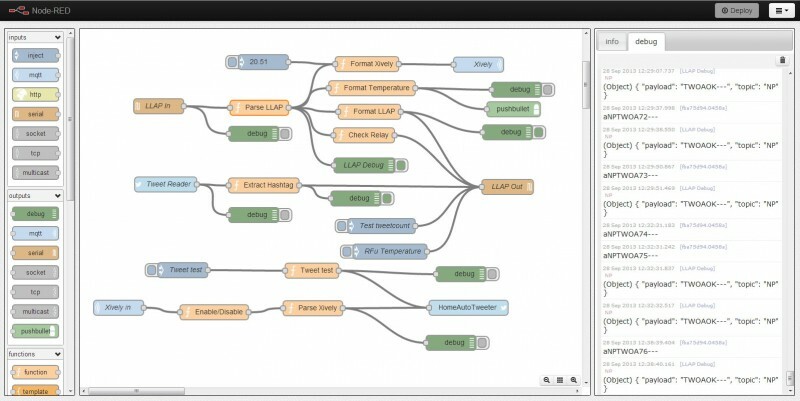 The Xively output was setup to send the request to a newly created feed and datastream using the MQTT API. This is easy to setup using a MQTT output node, entering the hostname api.xively.com and using a topic of api_key/v2/feeds/feed_number/datastreams/0.csv. Where api_key is the API key for the feed with write permissions and feed_number is the number of the feed. These can be pasted into the function nodes to perform the given action. For some reason the code tags are not preserving the format. That’s it, the hack was entered into the Internet of Things category and won first prize, winning a Fez Spider starter kit worth about £200. 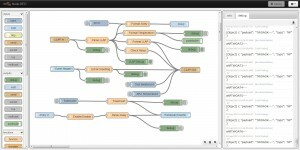 Look out for some .NET Gadgeteer posts! My slides from the Over the Air presentation are available at SlideShare.